Great shot. Love how the red leather matches Ellsworth. You should make that into a card. It is quite a striking photo. Please tell me he doesn’t really use spurs on Ellsworth? Yes, Ryan is using spurs. Can you control you legs so that you will know when you have applied the spur to your horse’s side? Are your legs quiet and not banging your horse’s side at every stride? Do you ride with your toes pointed outwards and your heels permanently digging into your horse’s side? If the answers to questions 1 and 2 is no and yes to number 3, then it will be too early for you to use the spur. If when you ride your horse you whack him at every stride with the long whip you would expect your horse to be initially upset and after a time completely dull, dead to the leg and whip and resigned to the discomfort of you, the rider, hitting him for no good reason. Obviously this is totally unacceptable. You would deserve to be pulled off your horse, sat on by an extremely large all-in wrestler and beaten repeatedly with a whip to see how you liked it! Think about it, if you do not have control of your legs and you are digging your spur into you horse at every stride for no good reason, what’s the result? You will damage your horse’s confidence, cause him/her undeserved discomfort and ruin any relationship and respect you might have had up to that point with your horse. If you are in any doubt as to whether you are capable of using a spur with finesse, subtlety and prudence, seek the advice of an expert, a trainer whom you trust, who can watch you and give you his or her opinion as to whether spurs would be appropriate to use at your stage of riding and training. It goes without saying that spurs should never be used to injure a horse, and any style of spur capable of wounding a horse must be totally wrong. Also I must say here that bludgeoning a horse with dull or “small humane” spurs is also totally unacceptable. Bear in mind that if your spurs are too short you will have difficulty feeling them when you use them against your horse’s side. I don’t like these little diggy things you can buy in the UK. There is a belief that the smaller the shank of the spur, the more humane they are. This is nonsense. 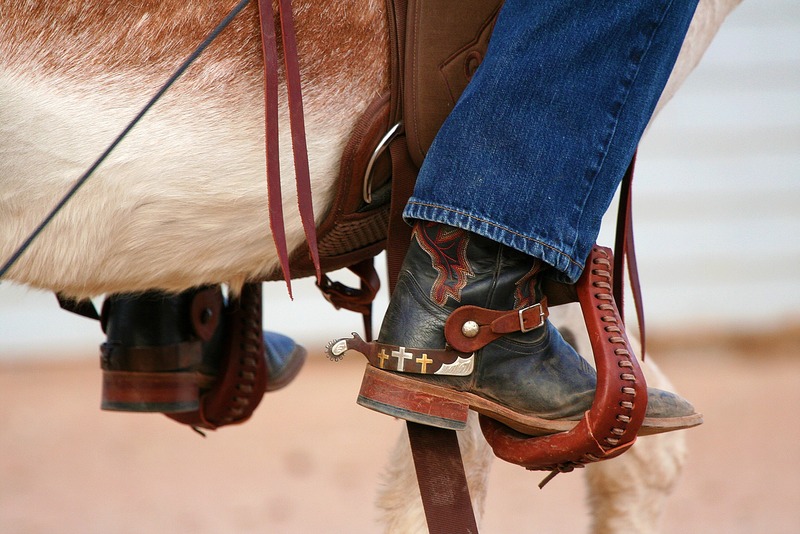 If they are too small the rider has to bring the toes so far away from the horse’s side to use the spur that the rider’s position has to be compromised. Also if the rider habitually grips with the knees and kicks with the lower leg, it will only be the horse that knows the spur has been applied. The length of the shank should be long enough so that the spur can be felt by both horse and rider but not too long that there is no room for error if the rider moves, even slightly, and touches the horse’s side with the spur by mistake. Think of spurs as a sculptor would use his chisels. He would use a finer, smaller chisel to refine his work and bring out the beauty of the piece. Spurs are not implements of torture or crudity: they are designed to engender more sophisticated feel and response in both horse and rider. As you progress and start to ride the more advanced dressage tests, (medium and above) you will find that wearing spurs will be mandatory. By this stage the horse must be so acclimatized to, and trusting of the rider’s leg aids that use of spurs can be nothing but refinement and a back-up for your normal, light, subtle, almost invisible leg aids. If however there is a problem with using spurs, something fundamental has gone wrong with the training. You must find out what and if necessary go back to basics. I’d recognize Ellsworth’s cute tummy anywhere. Is that you on Ellesworth?!!! No, not yet. That’s Ryan, his trainer. Great boots. They would be perfect for Las Cruces (city of the crosses). That is a great shot. Love it! And the others are right… it would make a great framed photo or Christmas Card! That is such an awesome picture!!! Well done.